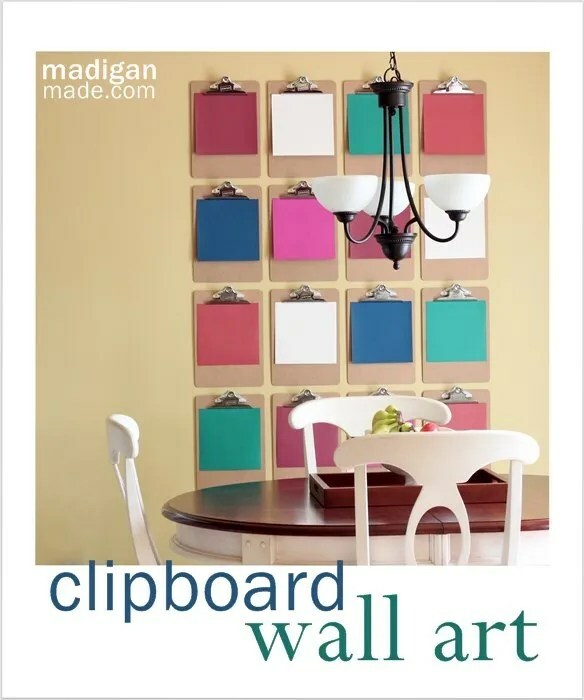 Madigan made… easy, changeable, DIY wall art in the kitchen. Your eyes do not deceive you… my kitchen chalkboard is gone! As I hinted last month, I’ve been itching to redo this wall area of our kitchen lately. I loved the big chalkboard, but I’m ready to do something new on that wall space. But what to put there? I’ve thought about this for a long, long time. I’m sure this does not come as a surprise to you, but I’m a fan of DIY wall décor. I knew I wanted to fill the space with something large. I wanted to draw the eye up vertically. I also wanted to be able to change the wall décor with the seasons (or my mood!). I think that is what I loved about the chalkboard wall the most…the changeability. The cheapest and simplest way to get the look I wanted was to use clipboards. (Some of my inspiration came from clipboard ideas at Every Creative Endeavor, Crap I’ve Made and A Beautiful Mess.) 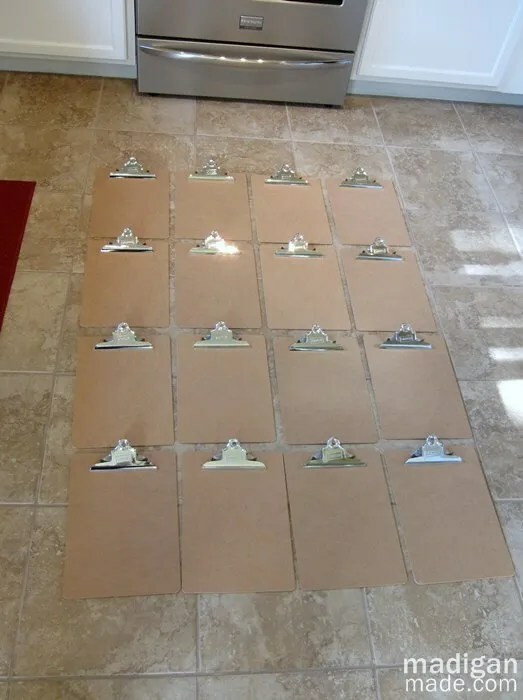 For about $27 worth of clipboards (16 total) and several packs of picture hanging strips, I now have a huge installation area that can be changed at any whim. To hang the clipboards evenly, first I laid them out on the kitchen floor and measured the area that they covered. Then, I placed tape along the imaginary perimeter on the wall where I wanted the clipboards to go. I needed to ensure that they were centered on the table and ceiling fixture. I worked from the top and center downward and placed the clipboards on the walls. I aimed to have about a 1 inch space between all of the clipboards. I used picture hanging strips in the top two corners of each board and followed the package directions to adhere them the the wall. It took time to measure and hang each one, but I got into a rhythm as I worked. 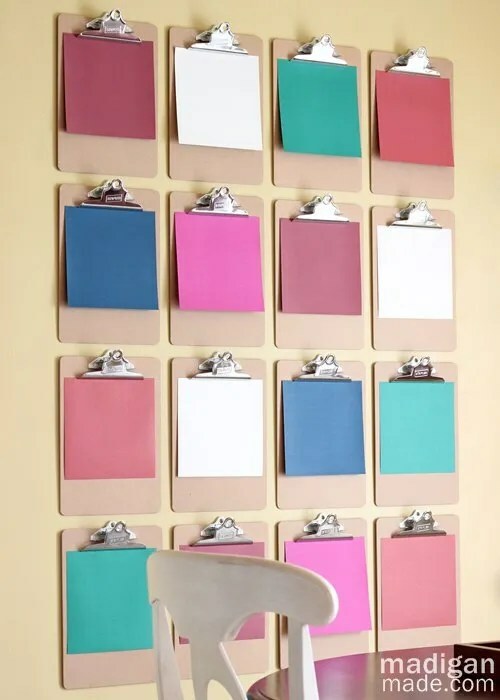 Plus, by using the picture hanging strips, I could reposition the clipboards gently if I needed to adjust them. I contemplated decorating or painting the boards or the metal clips… but I left them plain for now. I kind of like the raw chipboard color with the silver metal. It will be a neutral background for whatever I want to show off in the clipboards. As soon as I got these clipboard up on the walls, I was anxious to see what they looked like with ‘something’ in them. Since it was the middle of November, I was not quite ready to start holiday decorating. So for a test, I just grabbed a pack of 8”x8” card stock that I already had in fall shades. I picked five of the colors and randomly clipped them up on the wall. I wasn’t sure if using squares of colored paper would be ‘enough’… but I love it! I’m still not sure what I’m going to do with the old chalkboard and decorative plates. I think I can move them to other parts of the home down the road. We’ll see! In the meantime, I’m looking forward to changing out this area of the kitchen for each season. The possibilities are endless… cards at Christmastime, old calendar photos, printables, photos, sketches, ephemera, oversized letters, etc. And you can bet that I’ll share the changes here with you! Stay tuned!